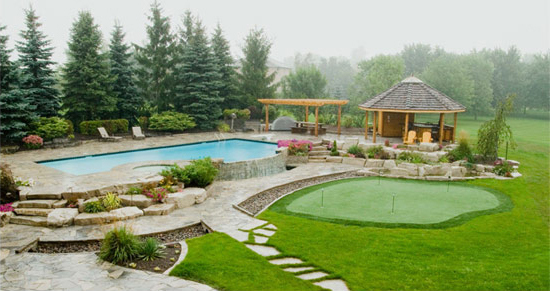 In order to tie your new swimming pool into the look and feel of your property, landscaping and hardscaping are ideal. Pools R Us is happy to provide swimming pool landscaping in Melbourne alongside the construction of the pool itself – after all, not everyone has been blessed with a green thumb. Our expert team can also be of assistance in situations when you have no idea what you want the space to look like. We have a wide range of pool landscaping ideas for Melbourne properties and are more than happy to show you some examples of projects we have worked on in the past. During our initial consultation, during which we discuss potential pools for your property, please let us know if you’re also interested in landscaping. This will enable us to craft the pool landscaping design in Melbourne at the same time, helping us to tie them together from the beginning. Many homeowners like the idea of pool decking in Melbourne, as it provides the area with a more natural appearance as well as ample room for entertaining. If timber has been used elsewhere around your property, we can also use the same species in your decking for continuity. As well as constructing the deck, we will handle any staining and treating to ensure that it is able to withstand exposure to such a wet environment. We can also provide pool paving in Melbourne if you’re after a slightly different look. Many homeowners love the sleek and natural appearance of pavers, which are able to withstand the harsh wet, chlorine and even salt environment around your swimming pool. We can work with a variety of different pavers – including sandstone, bluestone, granite and limestone – to ensure that we achieve exactly the look and feel you’re going for. Did you know that Pools R Us can also create amazing pool water features in Melbourne? This could include a gentle waterfall or a rushing fountain – the options are endless. If you have a particular type of feature in mind, let us know and we will see what we can do. If you would like to add a water feature to your swimming pool, please let us know from the very beginning, as we will need to incorporate it into the initial designs. Pools R Us can provide pool landscaping for projects that we complete across Melbourne and the Mornington Peninsula, including: Rosebud, Rye, Mount Martha, Rowville, Glen Waverley, Mount Waverley, Sandringham, Pakenham, Cranbourne, Narre Warren, Dingley, Sandhurst, Aspendale and Frankston. How can I keep my deck looking its best? There are actually a number of things you can do to ensure that your pool decking remains in tiptop condition – clean it frequently using a leaf blower or hose, clean up spills immediately to prevent staining, and keep the area free of overhanging trees (leaves and fruit can stain). You could also look at the options of plastic and composite materials – these are more expensive than timber but have a massive advantage of being long lasting and UV proof. Are there any benefits of sealing pavers? You should never underestimate the benefits that sealing your pool paving can bring. This will not only help to preserve their colour, it will help you to manage those everyday stains that occur from time to time. This is because the sealant creates an impenetrable layer between the paver and the stain. Will pool water harm grass and shrubs planted nearby? The chlorine in pool water is about one part-per- million (ppm), which is similar to what is found in the water coming out of our taps so it shouldn’t cause any harm to your plants. If you have a saltwater pool, however, you may want to ensure that grass and shrubs are planted a bit further away.